Founder and Director of Fusion Dance and Music Academy. 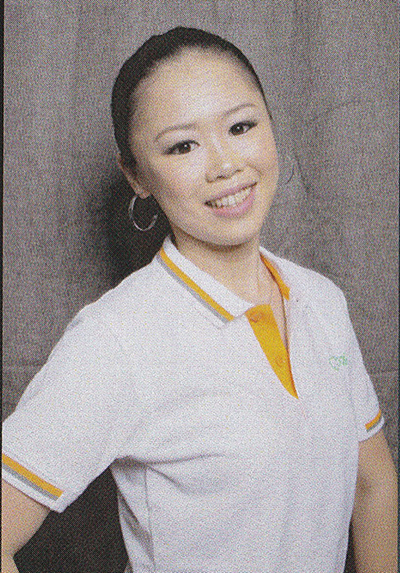 Caterine has been teaching ballet for more than 15 years in several schools within the Kepong vicinity. Besides that, she too teaches Latin & Belly Dance. Due to her artistic inclination, she is also accomplished pianist and teaches piano during the weekends. She holds the certificate of Ballet Teaching Studies from Royal Academy of Dance (RAD), London. Catherine has always been enthusiastic in dancing. Having taken part in several classical ballet solo competitions organized by the Dance Society of Malaysia in her young days. She is now also actively competes and has won numerous of Latin Dance Championships. Aside from taking part in competitions, she also actively involved in performing and choreographing for events and corporate show such as Soft-land Breast Cancer Charity in year 2012-2014 as well as wedding and anniversary shows. Catherine performed in a duet in a duet in ‘Dancing Thru Broadway’ a musical directed by Malaysia’s renowned by Catholic High Scholl in Petaling Jaya in their “CHS Dance Extravaganza 2013”. Other than dancing or teaching, Catherine completed her secretarial course and now engaged with an insurance company on the part-time basis. She also completed her make-up course on April 2014. She is now actively involved as a make-up artist for ONE FM, 8TV, NTV7 represented by Backstage Academy. Welcome to Fusion Dance & Music Academy 1st school concert. The main purpose of this concert is to showcase the many talents of our students to their parents and friends. It is also an opportunity for our students to express themselves through song, music and dance. Much efforts, hard work and hours of practice and rehearsals have been put in to prepare for this concert so that the students gain the confidence when performing in front of an audience. In addition, it is also an avenue for the student’s parents to witness their children’ progress! Students have benefited much from training and learning from our academy. Apart from learning the syllabus, the whole journey, amongst others, helps students to build up their confidence, install self-discipline which will greatly add asset as a whole. Attention will always be given to individuals focusing on their respecting strengths and talents. The academy would like to take this opportunity to thank all parents and guardians. Your children wouldn’t have done it without your continuous support and encouragement. To the team of professional teachers and instructors, who have given so much of their time of professional teachers and instructors, who have given so much of their time to unleash the full potential of the students, a big thank you goes out to you as well! Last but not least, to all who have helped in one way or another in making this concert success.